The only downside of Oran Mor's "A Play, A Pie & A Pint" seasons is that unless you wait for the reviews to come out, potential audiences have little to go on other than a line or two that often reveals little. As a result it can be a bit hit and miss - not in the sense of quality, more as to personal taste. But with their short season of Corona Classic Cuts the plays are cut-down adaptations of well known pieces, so you have a better idea of what to expect. This week saw the first of this year's four productions - 'Medea' by Euripides, translated by Alistair Elliot and adapted/directed by Paddy Cunneen. Cara Kelly gives a wonderfully engaging performance as the mistreated title character as she wreaks a horrific revenge on her errant husband Jason, his wife-to-be and her father, King Creon. Kelly's ability to connect directly with each audience member makes Medea's justifications pretty convincing - at least until we are confronted by the shattering reality of her actions. Candida Benson is tasked with playing all the male characters in the play - including Jason and Creon. When an actor is asked to play so many characters in a short period the easy option is to play it for laughs and exaggerate the characters, but Benson and director Cunneen choose the harder course and Benson pulls it off beautifully making each character fully formed and distinct. Kelly and Benson are accompanied by an effective chorus of the women of Corinth, played by students from the University of the West of Scotland. With a run time of almost the full hour, this was considerably longer than most of Oran Mor's shows but it never felt it and I suspect over the course of the week some audience members may have found themselves explaining to bosses why they were late back from lunch! An excellent start to this short season which continues next week with "Lady Windemere's Fan". 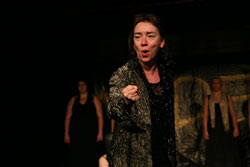 Medea has now completed its run at Oran Mor.